Apalit, Philippines – Visibly joyful and thankful, thousands upon thousands members of the Church of God International (MCGI) congregated to join the International Thanksgiving to God (ITG) for the fourth quarter on December 21-23, this year. 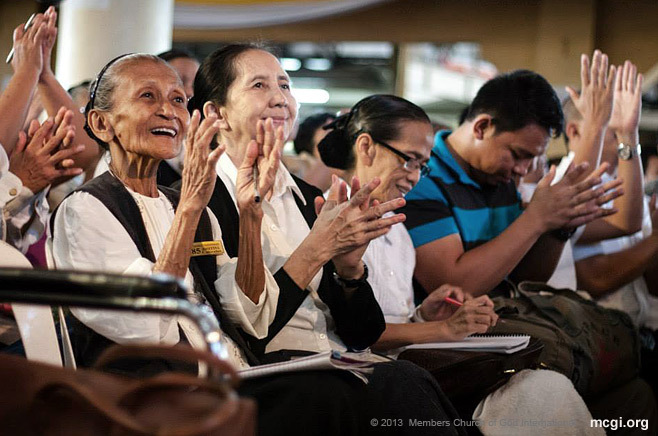 ITG is the most anticipated Church event every quarter and the culmination of all the big reasons that MCGI is thankful for among others, like the 17,850 newly baptized members from January to December 21, 2013. This figure, accounting baptisms held across the country and in other parts of the globe, was revealed by Presiding Minister to MCGI Bro. Eliseo F. Soriano on the ITG’s first day. The ITG theme, “Joyous Thanksgiving to God,” (Masayang Pagpapasalamat sa Dios), was announced by Bro. 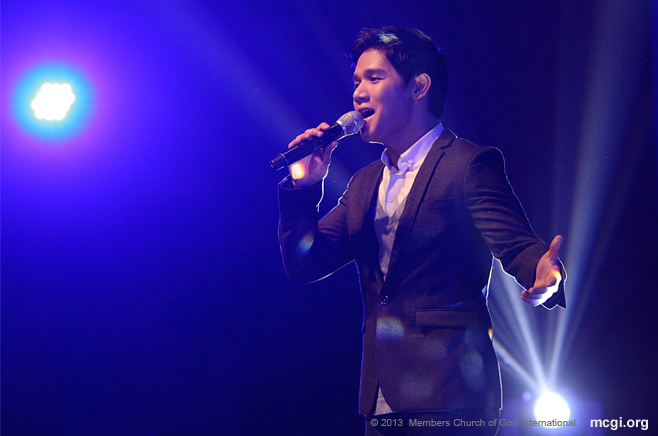 Eli Soriano himself during the Thanksgiving service to God before the much-awaited three-day event. For a full three days, Bro. Eli and Vice-Presiding Minister Bro. Daniel Razon delivered before the congregation a total of three different biblical topics. On the first day, MCGI Leaders discussed the mishaps brought about by the mistranslation of the Holy Scriptures and the rightful way of using the Bible. The ways as to how Christians should eat and live by faith and the reasons was discussed on the second day. Why Christians should believe that there is knowledge and wisdom in every word of God meanwhile, was on the third day. ITG is an opportune time for Bro. Eli and Bro. Daniel to serve a more comprehensive and detailed discussion of biblical topics. The longer congregational time hence allows for deeper understanding and revelation of new layers of biblical truths. It is the delight of God and Jesus Christ for the Church to offer the sacrifice of thanksgiving with gladness and cheerfulness, according to Bro. Soriano. The international evangelist added that it is God’s will for His people to serve Him happily, citing Psalms 100:2; 37:4, and Philippians 4:4. Throughout the three-day International Thanksgiving, other activities included sharing of testimonies of faith, singing and dancing to songs of praises by different regions, performances invited guests, feeding the indigents, and listening to spiritual topics. “I am really glad … I cannot fathom the joy I feel in my heart each time I sing songs of praises to God,” shared Jastin Villanueva of Quezon City, Metro Manila, one of the attendees of this quarter’s ITG. “The topics are also very wonderful. It is the first time I heard them (and) the mysteries within the topics were amazing,” she further remarked. 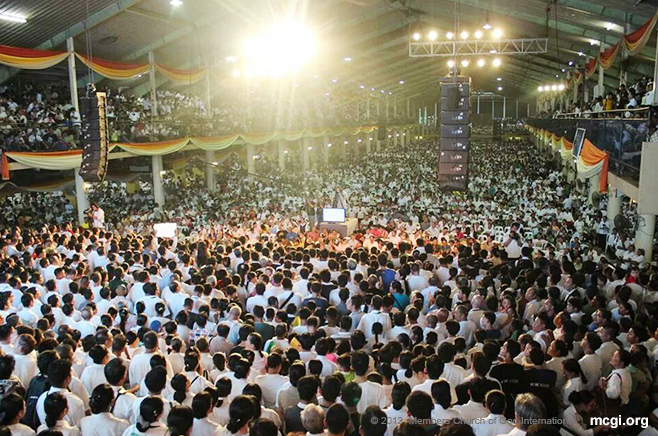 In the Philippines, members see to it that they personally come to the ADD Convention Center in Pampanga, where majority of brethren from all over the Philippines, and even from other countries flock to in order to experience the festive celebration. Isabel Dugaduga travelled all the way from Davao City, a metropolitan area in Southern Mindanao, to Apalit to celebrate the International Thanksgiving. “It is different when you are here in Apalit!,” she remarked. “The atmosphere of thanksgiving is more felt here… It is joyful to see brethren from various places giving thanks altogether,” shared the group of brothers and sisters from San Pablo, Laguna. The use of satellite and Internet facilities – which in effect break geographic barriers – had allowed members from the rest of the Philippines and the globe to join the proceedings. Non-native Tagalog and English speakers were able to listen to the topics through interpreters. The live translations included Chinese, French, German, Japanese, Portuguese, and Spanish. Pampanga, Philippines — Bro. Eliseo F. Soriano reiterated the importance of concerted effort in crafting songs of praise in the A Song Of Praise (ASOP) Music Festival on December 24, 2013. The biannual songwriting event’s main judge, Bro. Eli, remarked that if composers, lyricists, and musicians from different Church regions worked together, the songs produced would be perfect. 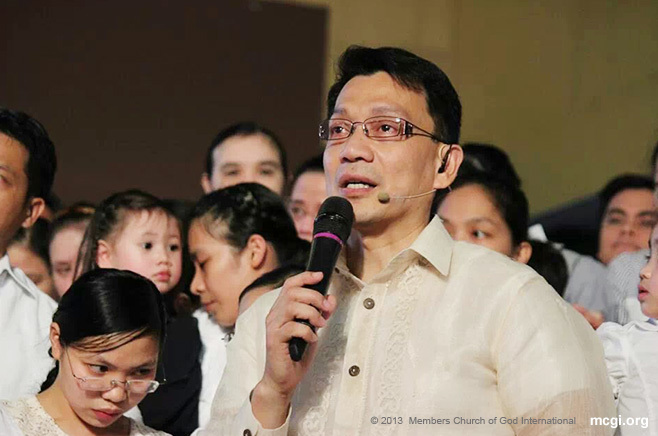 The Presiding Minister to the Members Church of God International (MCGI) first made the call for the same motion from the organizers during the December 2008 edition of ASOP Music Festival. He moved that it be a “division effort,” where ASOP Committees per Church division all around the world would work on a song entry for it to be the best. Bro. Eli and Vice-Presiding Minister Bro. Daniel Razon launched ASOP in 2004 to encourage members Church-wide in making more original praise songs for God. Bro. Eli, host of MCGI’s religious program The Old Path (Ang Dating Daan in the vernacular), also highlighted the importance of adding biblical creativity in songwriting. He cited David in Psalm 22:6: “But I am a worm, and no man; a reproach of men, and despised of the people,” and said how the preacher used such words in exalting God. He also mentioned that songs are an expression of human emotions. To give a more imprinting example, Bro. Eli even sang The Last Leaf by the Cascades as a song that leaves something to ponder on. In the Bible however, he added that the Songs of Solomon express love, while King David’s psalms express deep gratitude to God. “It must have wisdom,” remarked Bro. Soriano about songs of praises. In terms of judging, Bro. Eli added that the bulk of scores goes to the lyrics as the songs are for praising God. “A good song has valuable lyrics,” he noted. The group effort includes a screening committee that will see the song entries firsthand to correct possible errors in melody and lyrics. Salamat Amang Banal (Thank You Holy Father) by Bro. Noel Santos and Sis. Emily Schaff from Germany emerged as the winning song. Bro. Pablo Buan’s May Ngiti O Luha Man (In Smiles or Tears) was proclaimed 1st Runner-Up while Bro. Jude Abarca’s Dahil Mayro’ng Ngayon followed his fellow representative from Singapore as 2nd Runner-Up. For 3rd Runner-Up, Sis. Loida Dumandan from South America claimed the prize with her entry, Purihin Ang Ngalan Mo (Praise Your Name). Sis. Sally Morgan’s song, Dahil Ikaw Ang Aking Dios (Because You Are My God), from Australia won fourth place. The winners received plaques and cash prizes, tax-free. The winning song won P100,000, while succeeding entries got 50,000, 30,000, 25,000 and 20,000, respectively. Bro. Eli also gave non-winners 10,000 each as consolation prizes. The next ASOP Music Festival is expected to be in March 2014, before the International Thanksgiving on April 5-7, 2014. The nationwide blood donation drive of the Members Church of God International (MCGI), which gathered a total of 2,070 blood units from 58 key locations on December 15, earned recognition from the Department of Health (DOH) of the Philippines. This quarterly endeavour organized by the Church’s philanthropic arm, Ang Dating Daan Foundation, constantly draws support and citation from the Philippine Blood Center (PBC), the blood services organization of the Department of Health. Earlier this month, the PBC honored the contributions of the Church with a Jose Rizal Award, the highest laurel in the Dugong Bayani Awards sponsored by the DOH. MCGI was a recipient of the same recognition last year. The DOH field offices in the Bicol Region cited the continuous undertaking of MCGI of the blood drive in order to contribute to the cause of the health department. “We not only have the individual citizens and the local government units to help us but also the private sector and a religious group like you,” Balboa added. Another local health unit in the Bicol Region, Legazpi City, also acknowledged the blood donation drive that MCGI mount regularly. “We are thankful to you for your relentless cooperation and assistance,” said Legaspi City Health Officer Dr. Fulbert Galiego. 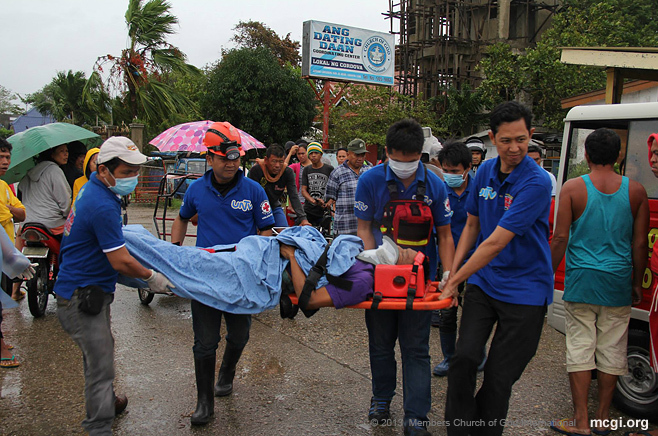 The MCGI chapters from the Bicol region and the rest of Visayas area were able to conduct the blood donation activity in spite of their grave situation following the recent onslaught of Super Typhoon Yolanda. From this part of the country alone, the event yielded 405 units. “I am grateful to God because through this, I am able to help my fellow citizens,” shared Owen Velasco of Mandaue City, Cebu. “I am happy because the last time we held a bloodletting drive, about 40 to 60 people were able to donate; after the Typhoon Yolanda, the figure doubled,” he added. The Region 7 of Visayas, which covers Cebu province, is one of the most devastated areas by the typhoon, which is now regarded the most powerful storm that had landed the planet. The Ang Dating Daan Founation held another round of simultaneous blood donation activity in thirteen locations before the end of the year until January next year to provide more blood units to the Department of Health. On a daily basis, approximately 2,500 units are needed in the country. An MCGI blood donor in Apalit, Pampanga getting his blood tested by a Philippine Blood Center staff on December 15, 2013. As part of its blood assistance commitment to the Philippine Red Cross (PRC), the Members Church of God International (MCGI) successfully held a mass blood donation effort at 58 locations nationwide last December 15, 2013. Out of 2,904 registrants, the blood drive collected 2,070 bags of blood, data from ADD Foundation showed. The PRC and the Department of Health’s Philippine Blood Center has the full support of the religious group presided to by Bro. Eliseo F. Soriano since 2009. Last year, a total of 9,920 blood bags have been accumulated benefitting both rich and poor people in need of blood, a contribution that earned for MCGI the Jose Rizal Award granted by Philippine Blood Center (PBC) in 2012. Extensive preparations were undertaken which made this lifesaving event successful. 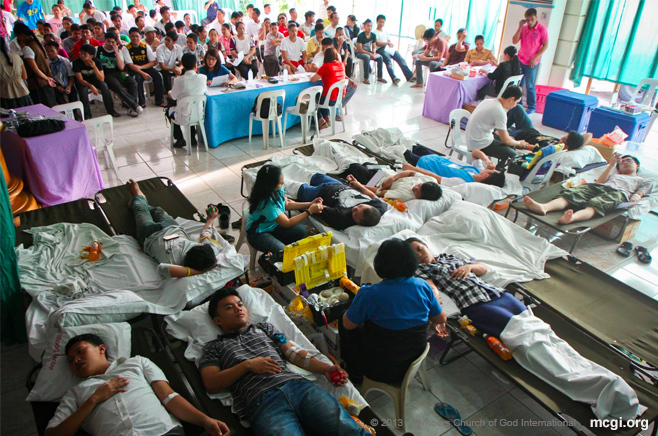 MCGI has opened different sites all over the Philippines and even in abroad to accommodate the unpaid blood donors who came Sunday. 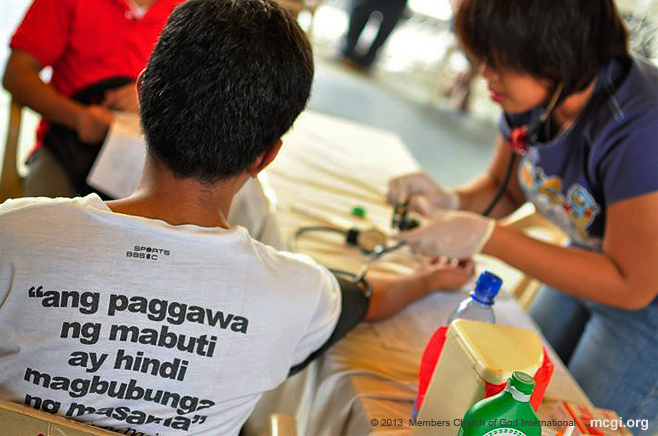 The quarterly mass blood drive is part of MCGI’s numerous public service works spearheaded by Bro. Eli andVice-Presiding Minister to MCGI Bro. Daniel Razon. Other public service works initiated by the MCGI Leaders include the medical missions, free legal assistance, free transport commuter rides, and more of the like. 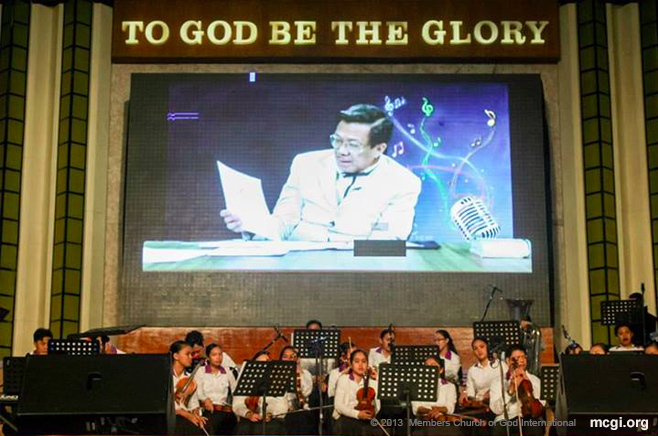 As the Members Church of God International’s (MCGI) celebration of its International Thanksgiving (ITG) for the fourth quarter draws near, congregants from all over the world express their anticipation using social media. The year-end spiritual celebration is set on December 21-23, 2013. MCGI’s International Thanksgiving celebration is a festive, quarterly event commemorating the bounty of blessings they have received for the past three months. The celebration is vernacularly known as Pasalamat ng Katawan or PNK. Church members expressed their thrill and excitement about the upcoming celebration followed by the official hashtags: #HappyPNK and #Happy ITG through social networking sites such as Facebook, Twitter, Google Plus and Instagram. “It’s getting near! #HappyPNK #HappyITG,” Twitter user Fred Dagpin posted on December 10, eleven days before the revelry. Divina Arguelles, a member from Laguna, also expressed her words of excitement through Facebook. “Advance #HappyPNK. Thanks be to God for another quarter of a year He had given us. #soexcited #HappyITG,” wrote Arguelles. Spearheading the initiative is MCGI’s official Facebook and Twitter accounts, which has started a countdown for the International Thanksgiving. The series of posts of the International Thanksgiving countdown features photos of the brethren coming from different MCGI chapters worldwide, which can be easily shared on their own timelines. Since the series’ release, it has garnered positive feedback and support from the online community, especially from those who are abroad. One of the earlier comments posted is Cynch Solatorio-Brul’s of Ireland: “Advance Happy Thanksgiving of the Body from your brethren here in Ireland. Excitement overload! Through the PNK Countdown launched by MCGI’s Facebook and Twitter accounts, Church members are able to virtually extend their heartfelt greetings to their foreign brothers and sisters in other parts of the globe. Tatiana Freitas, a Portuguese sister from Rio de Janiero, Brazil, shared her warm regards to the brethren of United Arab Emirates who were featured in one of the countdown photos. “Que a paz de nosso Senhor Jesus Cristo esteja com todos os noasos irmãos aí em Emirados Árabes Unidos!” (May the peace of our Lord Jesus Christ be with our brothers in United Arab Emirates! ), she greeted. Prior to the three-day Thanksgiving celebration, Church leaders Bro. Eli Soriano and Bro. Daniel Razon make it a point to spiritually prepare Church members. Biblical topics aiming to strengthen the brethren’s faith and make them realize the value of expressing gratitude to God are taught during regular Thanksgiving services held every Saturday. Church members in the Philippines have already started pouring in at the Ang Dating Daan or ADD Convention Center in Pampanga as early as this week, days before the PNK or ITG festivities. Brethren at the ADD Convention Center during a Thanksgiving of the Body in 2013 during a biblical topic. Some of the brethren both from far and nearby countries abroad booked flights back to the Philippines to spend the three-day merriment at the Convention Center, where the bulk of the members go. Major MCGI chapters throughout the archipelago are also being opened to accommodate Church members in more remote locations. Meanwhile, key coordinating and conventions centers in North and South America, Europe, Asia, Middle East, and Africa are expected to house members and guests around the globe. For the past three months, the MCGI brethren are deeply grateful to God for countless reasons, which include the thousands of newly baptized brethren, the 33rd anniversary of the MCGI-produced religious program Ang Dating Daan, and the successful premiere of Bro. Razon’s film ‘Isang Araw’ (One Day) in celebration of his 30th year in service to God. Read short testimonials of faith from some of MCGI’s youngest brethren baptized on November 22, 2013 at the ADD Convention Center. Many changes happened in my life. At first, I had a lot of vices. But as Bro. Eli has said that vices should all be gone in Ang Dating Daan [Church of God International]. That’s why I got baptized because I really want to know the truth in the Bible, where you can see that [the teachings] are really written there. What Bro. Eli and Bro. Daniel say are really of great help to me because I had a lot of vices. After I was immersed, my feeling changed. Also, in everyday be it in work or in other things, the Lord is with you. Wherever you go, don’t forget the Lord. Always have faith; always call on Him. I’ve been to many religions but it’s the same, I still had a lot of vices. But as Bro. Eli said, if you will really follow what’s in the Bible, you will not do evil; you will not steal or anything. Your life will be well, if you will really obey God in your service. There’s nothing to say about Bro. Eli, especially since he is helpful to others, even the whole of Apalit benefits. First of all, I thank him because if there weren’t the The Old Path, I wouldn’t be here. People would have no program to hear words from that are really based in the Bible. I hope that Bro. El will always be healthy, that he won’t get sick, so the whole of the Philippines can hear him daily. I feel as if my heart was enlightened, my mind … I was under sins before that I couldn’t leave behind, as I was not a member of the Church of God yet wherein I am one of those who will follow the commandments of God freely, happily. I’ve been hoping that for a long time, until only now that perhaps, God willed it for me to lead a new life, a new start. I’m really very happy that I am a brother now. I got to listen on television. My papa just told me to watch it [The Old Path]. Then I got interested until I watched it continually. I listened to it as many questions have been answered already in the Itanong Mo Kay Soriano (Ask Bro. Eli) program. Bro. Eli, Bro. Daniel, many people thank you, and I’m one of them. You have truly been the way for us to [change], for our heart’s desire [to come true]. Many people now who are sinful really search for goodness, who to follow, who to be like. You have been a good model for us as you have really taught us the teachings of the Bible; you really showed them all. You didn’t conceal any word of God that all the people of the world should hear. You really read to us what we need Bro. Eli. I’m thankful that God made you an instrument. In our time, you will have many enemies to face. There are a lot of evil forces now that want to rule the world. Bro. Eli, may your health be better; take care of it. May you be stronger in the things that [you will face] in your life, the same with Bro. Daniel. I feel light, as if all my problems are gone and I feel close to God. When I was in high school, my kuya [older brother] listened to The Old Path. I don’t know if my kuya is already a member or not, as he is a seaman abroad. I got to listen through TV, radio. [Bro. Eliseo Soriano] taught the teachings clearly, and all my questions got answered through those who asked him in [his program]. May they continue what they are doing. May they never stop. I’m happy because for the longest time that I’ve been listening [to The Old Path], it’s only now that I got baptized, that I became a member of the true Church. I got to listen through radio when I was young, but I didn’t understand it well then. It’s only now, since about two years ago, that I really understand it. I just searched [religious programs] on radio. I compared their teachings, and I’ve proven this [Church of God International] to be the right one. Bro. Eli, I’m thankful for someone like you, as well as for Bro. Daniel. You are unlike any other, and I hope your life will be longer that you will be able to help many more people, lead many more souls. I feel peaceful, and not always worrying on what’s going to happen. I’m happy as well because my parents are already members so I am now with them to give thanks and serve [God]. I’m thankful first of all to God because my parents obeyed His commandment to teach us in the way that we should walk in from our childhood; until now, we haven’t strayed from that path. In other words, it’s here we stayed, where we grew up. This is what we obeyed until we grew up. Though I worked as an actor, I attended the KNC (Children’s Ministry) gatherings, so it wasn’t difficult for me. May God take care of them always because I have many friends and people I know whom I hope will see [Bro. Eli] also, will hear him. I hope that I will meet him someday as well. I’m happy because it’s like I have a new life; that’s what happened. I got to listen [to Bro. Eliseo Soriano] on television. My girlfriend’s mom is already a member and I went with them [to gatherings]. I saw that Bro. Eli’s program was good, and I got encouraged to join. Before the indoctrination sessions, I got to attend at a community prayer after the storm [Yolanda]. What they did was good. I hope that their lives will be longer and may they [lead] many more people. May God bless them. Sis. Annie: It was like I was given a new life. You will really feel Bro. Eli’s teachings. The transformation [it brings] is very [apparent]. It didn’t take me a long time [to believe]. Actually, it was just a couple of months ago through television. Nobody invited us. We just flipped the channel every now and then. After [seeing it], we always listened to it. We attended the indoctrination sessions together. Sis. Perla: We were Catholics before. In the spoofs of Brod Pete, they were like [imitating something], but I wasn’t aware that this existed. I was in the Catholic Church for many years. Since elementary, I studied in a Catholic school, until high school. But I really saw that there were many errors, so though I was Catholic, I didn’t observe their practices. Sis. Annie: I started high school in UST, until I graduated college there. We always studied Catholicism, but I never really had an experience wherein the Bible was being read to us. We never read the Bible. Only in this later part of my life that I said, “I want to seek the real word of God.” In Catholicism, we heard the Gospel through the first and second readings, but it’s only up to that point; there was never really a study of it. That’s why my attention was caught by the Bible Expositions of Bro. Eli. In Catholicism, we just follow whatever the teachings are. So whenever I attend and Bro. Eli teaches parables, and the differences of religions, and when he answers, he really goes to the Bible with the correlated verses, it validates the information that the words of God are really true – nothing more, nothing less; direct to the point. So I got really encouraged. Every time I flipped the channel, I just look for his [ The Old Path program]. Sometimes, the channel lineup gets mixed up, so every opportunity we get, we really like to listen. Sis. Annie: Firstly, I thank God because I found him through Bro. Eli, through his teachings. Before, it was only my husband who I see watching, and I didn’t think much of it then. However this June, I really tuned in to it. I really watched it continually. I have watched his Bible Expositions and his Truth in Focus. Sis. Perla: May they be given longer lives so that we can learn much more. We are also thankful because he really spends his time to educate everyone about the word of God, and in really spreading the word. You can really see his dedication in it. I think that’s what draws people, His words. I hope we’ll get to see [Bro. Eli] as well. I’m happy and I feel light. I’m now old. Before, I thought that the Lord was forgiving my sins, but it was only the priest. My belief was wrong. It’s only now that I knew the true forgiveness of the Lord. Their intentions and explanations are good. All they teach are true. That’s all and thanks be to God. Now that I’m baptized, I know that it’s going to be hard, but I must do it because my soul depends on it. It’s not my first time to be baptized as I experienced that in the Born Again. However, their manner of baptism was not good. Here, before you get baptized, you are first shown of what you are going to join; it is being explained. There, when I was baptized, it was just like normal, because they didn’t explain what you need to do or what’s going to happen. They said that you were baptized, that you were born again, but what do you understand about it? It was just like taking an ordinary shower. But having spirituality? It has none. It was my wife who has been listening to The Old Path for some time, and she wanted me to listen to it. One time, she was able to watch the Ask Bro. Eli program and she liked it. Whatever is good, she made me listen to it. So it would take us till in the wee hours of the morning just listening to it. Then after a week, we lost connection, so we turned to the Internet and were able to listen to Ask bro. Eli. All were good; all were taken from the Bible. The doctrines eventually became clear to us. Which is why when I was baptized, I really cried because I had committed many sins. I can’t explain how I wasn’t aware that I was sinning. I knew the other sins I was making, but the other ones, I wouldn’t have if I hadn’t heard them. That’s why I’m really thankful that I found the true Church that I need to join. So I’m really glad and thankful to the Lord that I found it. I will do everything needed, because if you don’t, you know where you’ll be and it’s going to be very hard. When I was baptized, it was a different feeling, not only in the flesh, but also in spirit. You will really see that you’re different; you’ll see change. I’m really thankful to the Lord. The Lord really willed to lent me strength that I may do the other things I need to do. Bro. Eli, Bro. Daniel, many, many thanks because the Lord used you. You preach well and I pray that you continue this, so you may lead many more souls in this Church. Because of all the churches I’ve seen, understood, and heard, this is not false because all the [teachings] are from the Bible, and not just from someone else’s imagination or idea, that whatever comes to their mind they will teach. All that you say are from the Bible, and that gives me joy because the Lord used preachers like you, Bro. Eli and Bro. Daniel. Many thanks to God. December 13, 2013 — Bro. Daniel Razon celebrated his 30 years of service to God and humanity on November 28, 2013 with the special screening of his latest film directorial effort, Isang Araw (One Day). The sequel to Isang Araw Lang (Just One Day), the movie is inspired by Bro. Daniel’s advocacy of the same name that promotes doing good even for a day. The film’s screening was the highlight of the special gala dubbed Rare Moments held at the Sofitel Philippine Plaza Manila. Attendees had the privilege of not only seeing the film firsthand, but also of sharing photo sessions with its actor, writer, and director – Bro. Daniel himself. As the film credits rolled and the lights turned on, some of the audience members found themselves switching between clapping their hands and wiping their eyes. “These things are what’s happening in reality,” reflected Annie Flores from Bataan province upon watching the film. Church members came all the way from London, Singapore, and the United Arab Emirates, and even from Philippine provinces as far as llocos just so they can show their support for the cause of the film and for the 30th spiritual birthday of Bro. Daniel, MCGI’s Vice-Presiding Minister. Part of the proceeds of Isang Araw will go to various public services captained by Bro. Eli Soriano and Bro. Daniel, like daily medical missions and feeding programs. Also held was a special auction of apparel worn in the movie to benefit Typhoon Yolanda (international name: Haiyan) survivors in southern Philippines. Due to public demand, the auction was extended. The Rare Moments event was hosted by Actress Jackie-Lou Blanco and UNTV Host Eagle Riggs. December 12, 2013 — “Let’s keep on doing more,” remarked Bro. 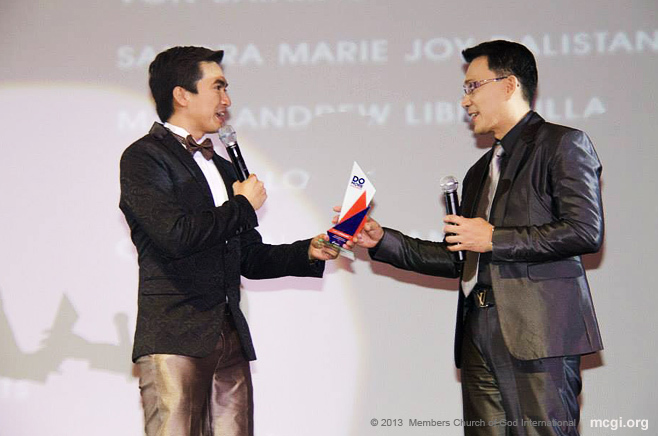 Daniel Razon after winning the first-ever Do More Awards as The Ultimate Luminary. The awards night by Rappler.com and Rexona was held at the Makati Shangri-La Hotel on November 28, 2013. UNTV Host Atty. Reggie Tongol accepted the award on behalf of Bro. Daniel, who was at the Sofitel Philippine Plaza Manila for his Rare Moments charity event. Bro. 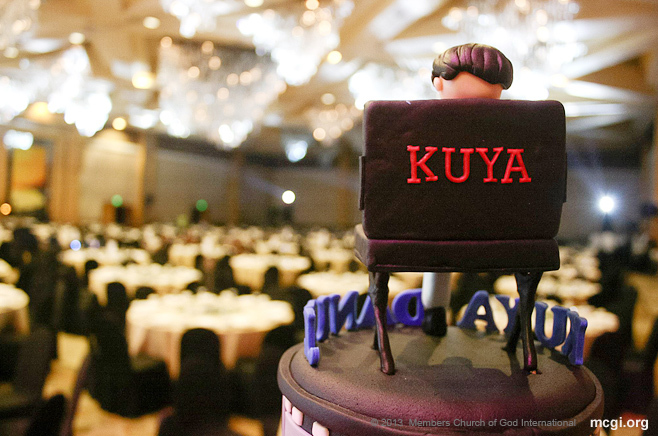 Daniel, Vice-Presiding Minister to the Members Church of God International (MCGI), is publicly known as “Kuya Daniel” of UNTV, the Philippines’ Public Service Channel. He spearheads the network’s many one-of-a-kind services like daily free rides and medical missions. Kuya Daniel launched the Kahit Isang Araw Lang (Just One Day) advocacy on February 24, 2009. 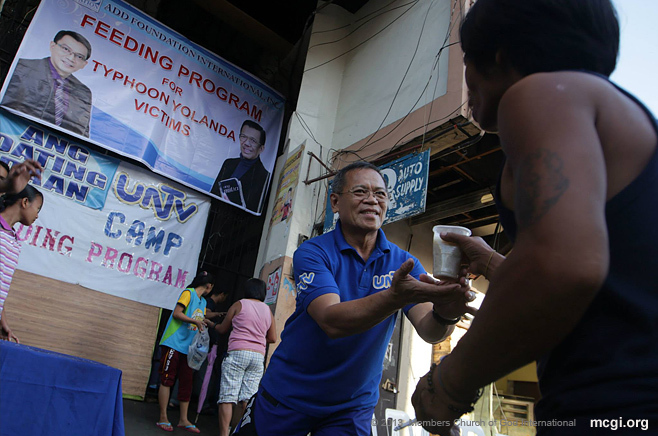 What started as a commentary on the plight of poor Filipinos have become the moving force behind professionals to give a day or more of their services to others for free. The advocacy has also been the inspiration of Bro. Daniel’s benefit concerts and films that have helped countless people — from the bereaved families of the Maguindanao Massacre to the survivors of Typhoon Haiyan (Yolanda). The UNTV-BMPI CEO also pioneered the network’s News and Rescue bureau on July 18, 2010, an effort acclaimed as the first in the country. News reporters were trained to become first-aid personnel. As the special screening of Kuya Daniel’s second charity-indie Isang Araw (One Day) ended, applauses subsided as Atty. Reggie called on him to go on stage to receive his award. “Thanks be to God, because I know that the honor and glory are not ours, but His in the heavens. To God be the glory,” said Bro. Daniel. Earlier in November, Kuya Daniel received the 1st Gintong Palad Awards for Public Service by the Movie Writers Welfare Foundation (MWWF). UNTV Host Louella De Cordova received the plaque on Bro. Daniel’s behalf at the One Esplanade, Manila Philippines. Read short testimonials of faith from some of MCGI’s youngest brethren baptized on November 15, 2013 at the ADD Convention Center. I feel really, really light, and it’s as if all the things I bore in my life are gone. The first time I listened to Bro. Eli was on radio with my wife. She and my children are already members; I’m the late one. First of all, I thank God; secondly, to Bro. Eli and Bro. Daniel for their preaching. I hope that they will continue what they are doing so that many more lost souls will be saved. I’m happy and I feel relieved. I’ve heard him [Bro. Eliseo Soriano] on TV a long time ago but I was just busy with my studies. But now, I’m already a graduate. My relatives and two uncles are members of the Church. The things that Bro. Eli said, I never heard from Catholicism. What he says are true and that’s what convinced me to join here. My message to Bro. Eli and Bro. Daniel, may they continue doing what they do, and may they live longer. I feel so happy and so light, and I feel really enlightened. That’s what I felt, as if a big load from my previous life has been lifted from me. My views and my speech have also been changed. Before I was quite wordy. But when I started attending The Old Path or the Church of God, I became restrained when I speak. Many changes took place. My husband always had brandy at home. Almost every night, he had a shot of it; he was a bartender before. But since he attended the indoctrination sessions, I didn’t see him anymore drinking. Many things changed in him so I got really convinced. [I see it] in his actions and speech. Before he was talkative, but now he’s quiet. He says that he doesn’t want to speak much because he might sin. I’m thankful and I [hope] that they stay strong so they’ll be able to help more [people]. When I go home, I’m going to see on the Internet about updates in the Church of God, so I’ll always be informed of works of the ministry. I thank Bro. Eli because he’s so humble. When I saw this place, I almost cried because it’s so huge. If Bro. Eli would exchange this for money, he would be very rich. But he chose to encourage people to know God. I always pray for his strength, as he is old already. I’m happy and it feels like as if I’m among the clouds right now. It was actually my husband who was listening to him; I’ve been listening for only a month now. But then I saw that I was gaining knowledge in the Bible, in the word of God. May the Lord will for their long lives that they may encourage and teach many more people the words of God. It feels good inside because I feel that my sins have been forgiven me. My parents brought me to the locale as they are members already. I didn’t attend the KNC [Children’s Ministry] as I didn’t like it then. Actually, it’s only now that I attended. I really liked the teachings. It’s as if I got enlightened of the things that I never heard nor understood before in my previous religion. May they continue what they do as they will be helping many more people. I feel good, and as if I’ve been born again. My aunt who is already a member invited me [to attend] and I got persuaded. I liked it. It was really only then that I heard Bro. Eli, in the indoctrination session. [Eventually] I got persuaded by the teachings of Bro. Eli. All I know is that when I started going to the locale, I went there nightly. May they have longer lives so that they will be able to each many more like me, that their lives may be transformed as well. It feels different; I feel light. It really is different and I feel the Holy Spirit [in me]. My brother has long been a member here, and he has been inviting us [family] since. Then, I spent my vacation at his place in Novaliches, as I’m from Malaria. Then, he invited me. I only got to listen to Bro. Eli that time, in the indoctrination sessions. I liked his teachings, message to people. He doesn’t beat around the bush, very direct to the point. I hope that they continue, and may our members multiply more. It feels really good; I feel really light. I’ve been watching Bro. Eli on television since the 90’s. I can’t remember the channel anymore but I watched him more when [The Old Path] was already on UNTV. Then, I just really felt that I wanted to be indoctrinated already, so I started. For Bro. Eli and Bro. Daniel, they’re really good and trustworthy. Thanks be to God. I feel like a load is off me; I feel light. I also have peace of mind. I’ve been listening to [Bro. Eliseo Soriano] on radio since the 80’s. Then perhaps it’s the Lord’s will that my family and me are now here with Bro. Eli. I am thankful to both of them because the Lord used them for us to be edified and truthful in faith. Well I’m so glad and I feel so happy and I feel unburdened [and have] the desire to be part of the work of Bro. Eli and the Church of God, [I believe that] despite the fact that my youngest brother is a layman pastor of the Fundamental Baptist Church. He was the one who introduced me to be a Baptist when I was in Laog. I still told him actually that the best and the clearest and broadest and the truest faith that we can get from the word of God is from Bro. Eli Soriano and Bro. Daniel. Before, I dreamt of Bro. Eli last November last year, November 2012. So I wanted to join the Church of God because of that dream I had. Because I saw myself attending a Bible Exposition of Bro. Eli and I asked a copy of the Holy Bible from him with his autograph. I requested him to sign it, and he obliged. He gave me a Bible with his autograph. When I was still in Naga maybe 9 years ago or so. I got to listen on DZRH that time, but it was on and off. But when I had to bring my youngest son to the Philippine Science High School about 2004, I once in a while tuned in to DZRH. I listened to Bro. Eli, and I found him to have the most… the deepest, the broadest, the clearest knowledge about the word of God. Well, considering that this is the 33rd Anniversary of his work, of their work I should say because they are two, congratulations to them and I wish them the best of the blessings of the Lord our God. They really are the true preachers in our country today. It should be that all Filipinos be members of The Church of God. That’s my message to them. Actually, I’ve been listening to Bro. Eli on radio and television for a long time. So I said, when I graduate, I will really try to be indoctrinated, until the time came. I learned everything from the doctrines. Now, all the heavy things that I always bore were lifted from me – all the sorrows and bitterness that I had for the longest time. So you’ll really know that what you feel in your heart is true. To Bro. Eli and Bro. Daniel, may they continue to strive for… with God’s mercy, may they reach many more people like me. A lot has really changed in my attitude, and in my way of life. Before, you only think of yourself; now, may we reach many more with God’s help. I hope to be a part of it, to help a little. 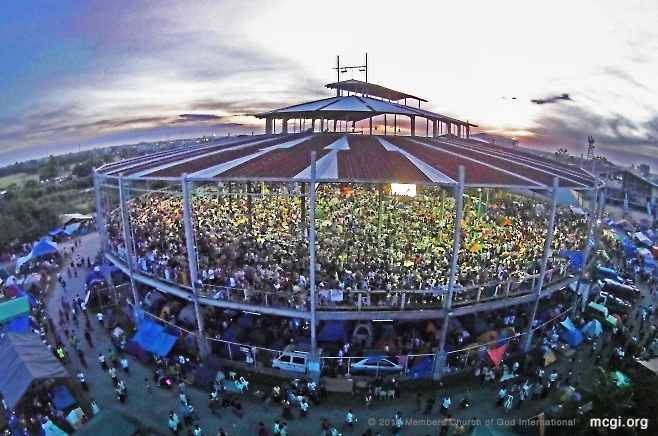 December 6, 2013 – Thousands of members of the Church of God International (MCGI) filled the Ang Dating Daan Convention Center in Apalit, Pampanga to offer songs of thanksgiving to God. The thanksgiving event’s main celebrant is MCGI Vice-Presiding Minister Bro. Daniel Razon, who celebrated his 30th year of service to God and humanity on November 28, 2013. Representatives from neighboring countries of Dubai, United Arab Emirates, Hong Kong, Singapore and even Australia went home to the Philippines to attend the thanksgiving celebration live. Aside from the numerous brethren in Pampanga who offered thanks to the Almighty, celebrators from various respective remote areas in the Philippines and all over the world also took part and sang songs of praise during the special celebration. Bro. 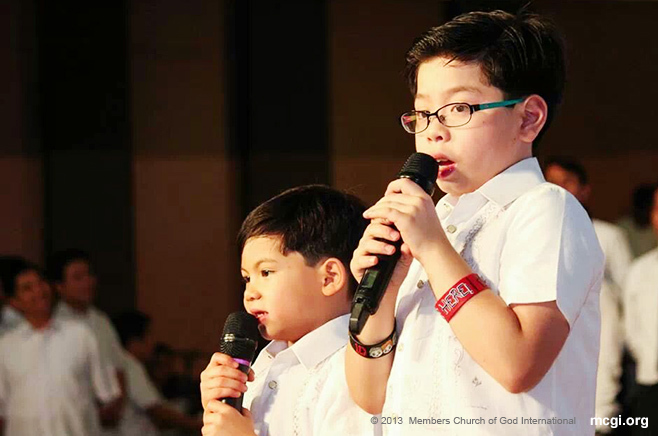 Daniel’s two youngest sons graced the stage in Pampanga to sing a special thanksgiving song to God for their father’s birthday. “Happy birthday, Pa, I love you. Thank you for giving us all of what we need and not what we want,” said Bro. Joshua Razon. “Thank God for giving us a father like you,” the 5-year old son of Bro. Daniel. Immediately following the crowd-pleasing number was the thanksgiving to God offering of Presiding Minister to MCGI Bro. Eliseo Soriano together with his household. Singing a heartwarming adaptation of the popular song “The Prayer” in the vernacular, the group led by Bro. Eli sang all the way from South America. They prayed for another year added to Bro. Daniel. Bro. Daniel’s mother, Sister Beth Razon expressed her love and greetings to Bro. Daniel Razon all the way from South America. “We may not always be together, but I hope, in God’s mercy, we will be together in life everlasting. Happy birthday, my son, you are beloved by us, and your whole household. Thanks be to God,” remarked in the vernacular by Sis. Beth. Bro. Daniel, after singing his offering of thanks, expressed gratitude to God for everyone who celebrated his birthday with him. “Thanks be to God for the gift of brethren like you in spirit, for parents in the Lord who serve with us. Though I am far from my biological parents, I am amongst many God-fearing parents who serve the Lord,” stated Bro. Razon. Before concluding the biblical discussion for the night, Bro. Eliseo Soriano gave his heartfelt spiritual birthday greeting to Bro. Daniel. 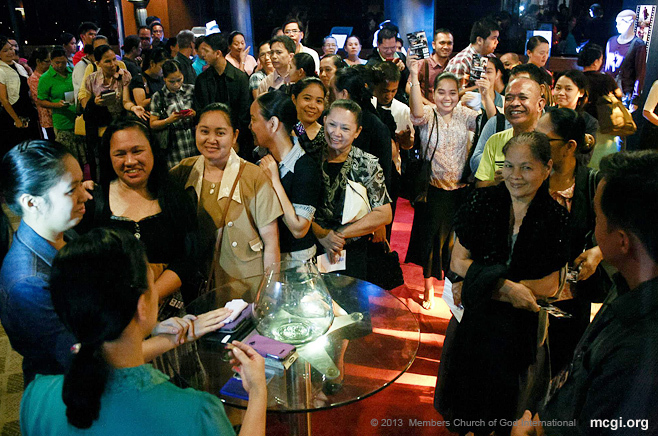 In just a regular baptism week, MCGI debuted 129 newly baptized brethren. One of which is local celebrity Joshua Dionisio. Some of the new members of the Church hail from Peru, Venezuela and Mexico, which are the fruits of MCGI’s fortified broadcast efforts in all corners of the world via tri-media and satellite efforts spearheaded by Bro. Eli Soriano and Bro. Daniel Razon. Bro. Miguel Perez from South America, on his thanksgiving testimony, mentioned that upon seeing Bro. Eli’s e-mail address, he contacted him right away. “Thanks be to God, I received his answer very quickly. And God blessed me. He gave me doctrines, wonderful doctrines that tell the truth,” stated Bro. Miguel. “Listen to Bro. Eli, ask your doubts,” said Sister Maria Isabel Vazquez Lara, another newly baptized sister who hails from Mexico. MCGI broadcasts have recently started in Mexico, and a locale chapter has been recently been opened for the country’s listeners. “I am grateful to God because I am one of the first ones here in Mexico,” remarked Sister Lara.